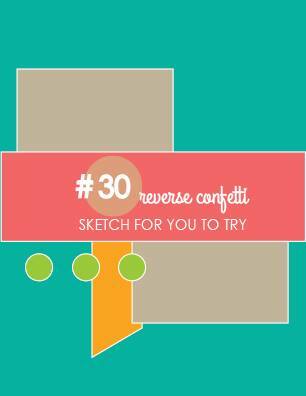 Last call for November Sketch For You To Try (SFYTT) challenge entries. You have until noon CST on the 29th to play along for a chance to win a $20 gift certificate and 'Fetti Fave title. Link up your entry HERE. 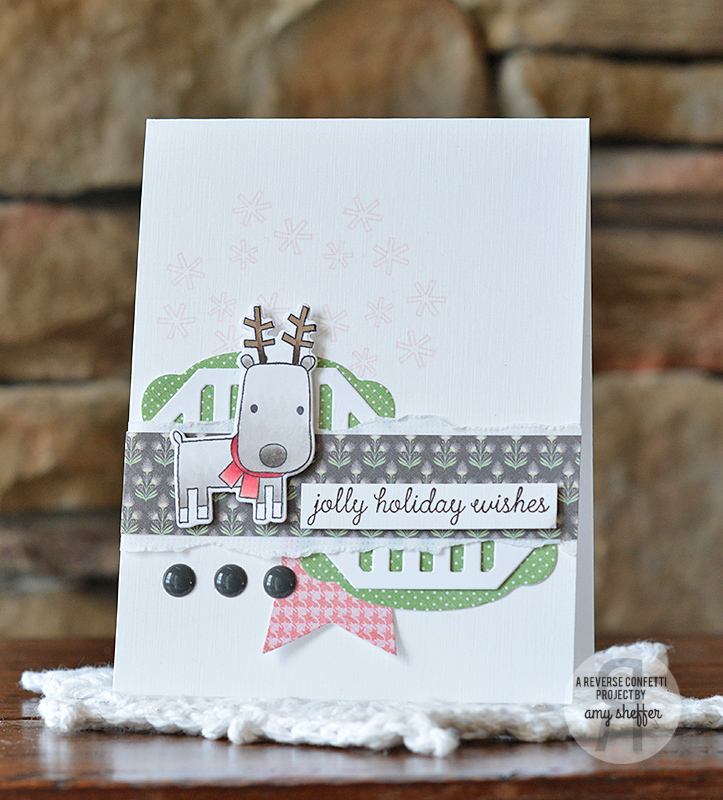 I put together a non-traditional holiday card using the adorable reindeer from Jolly Holiday, along with some new Basic Grey papers from their Sun Kissed line. I adore this little fella! Just look at that sweet face! 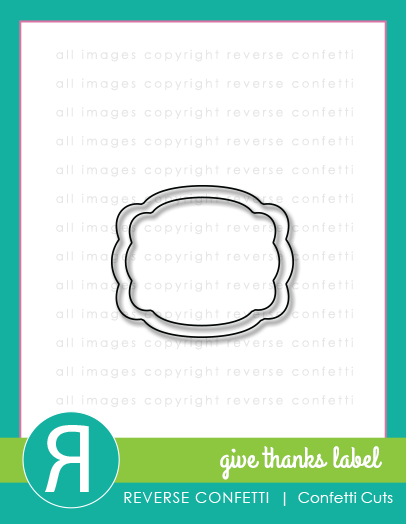 For the rectangular sketch elements (taupe on the sketch), I layered a white Topped Off Tag die-cut over the larger of the two Give Thanks Label die-cuts. 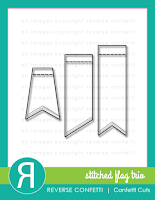 The pink fishtail flag was die-cut using one of the Stitched Flag Trio dies. I colored the reindeer with Copics and die-cut him with theJolly Holiday Confetti Cuts dies. Thanks for stopping by! Happy Thanksgiving to my American visitors! 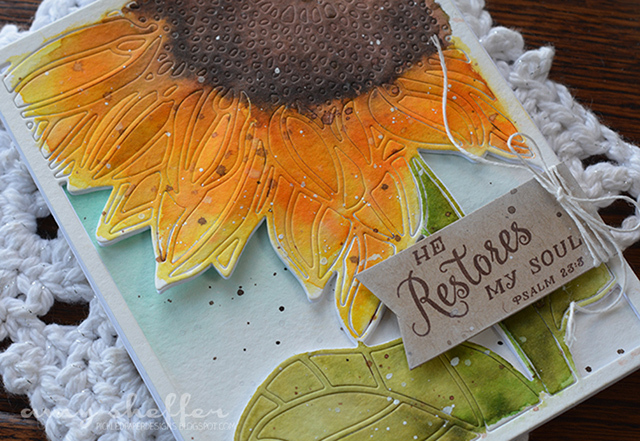 I'm on the Taylored Expressions blog today with a double feature -- same dies, same embossing folder, totally different results. Click HERE to check it out. Hope you're having a great week! I appreciate your visit! 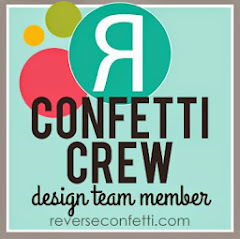 Join me today on the Reverse Confetti blog for Wednesday in the Works. 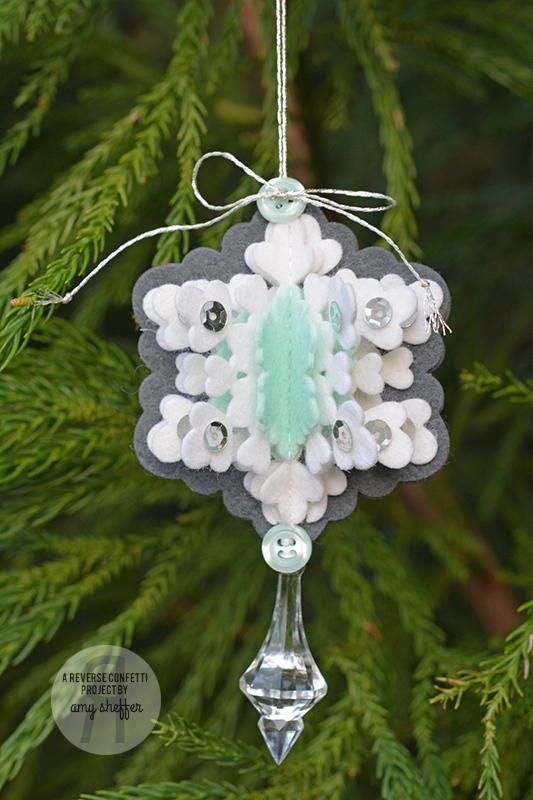 I'm sharing a quick photo tutorial on how to make this felt snowflake ornament / gift topper. We've come to the end of another Papertrey Ink release countdown. Such a fun collection of products this month! For this snowy scene, I've combined Nichole's Winter Woods, Heather's Fab Flakes, and Dawn's Tucked In: Sympathy. To give the birch trees a bit more dimension, I shaded one side. There's also some shading at the horizon line to help the snowy banks stand out. 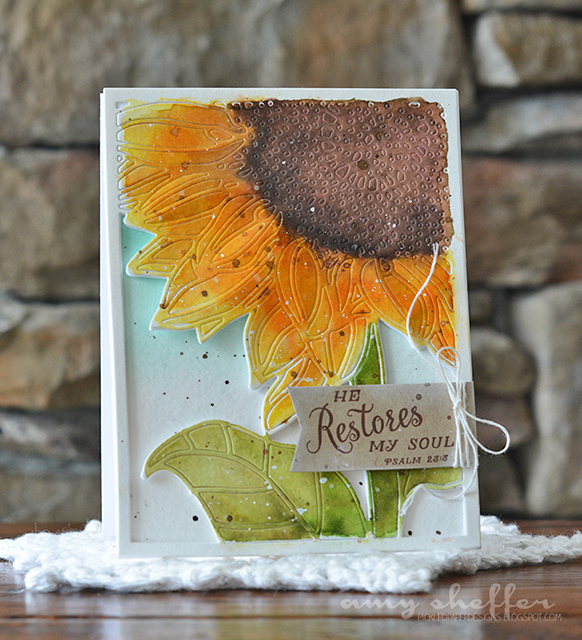 Here we have the gorgeous Sunflower Cover Plate and one of the Scriprture sentiments from Phrases & Prasies. 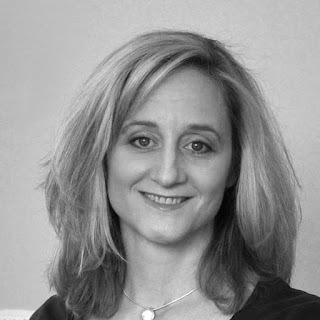 Dawn's Enclosed: Present is wonderfully all-occasion. 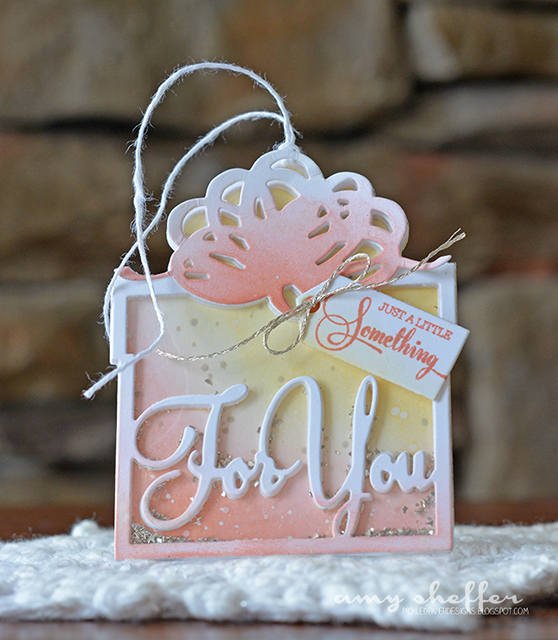 I sponged on the different inks with a blending tool, leaving the sentiment white. I stacked several layers together to make this a shaker card. Instead of adhering this to a separate tag die-cut, I threaded twine through the bows to make this the tag. 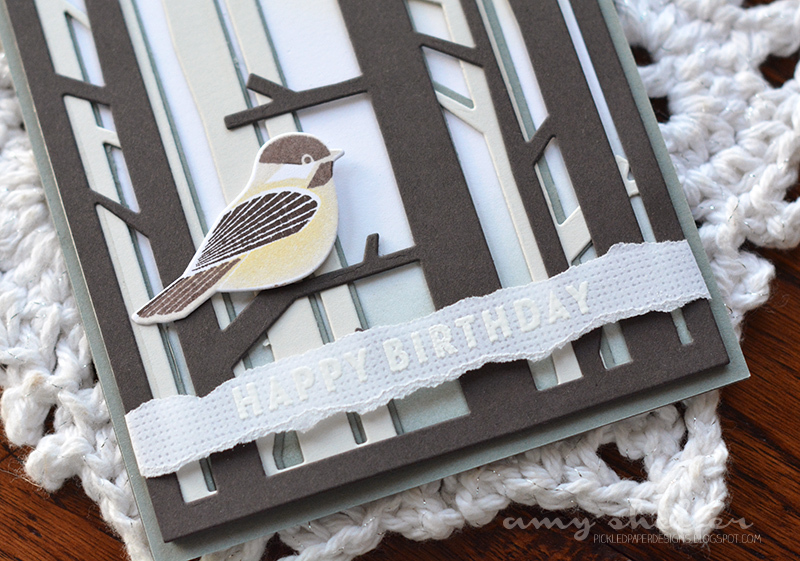 Here's a clean and simple everyday card featuring Winter Woods and Fab Flakes. They pair up beautifully. 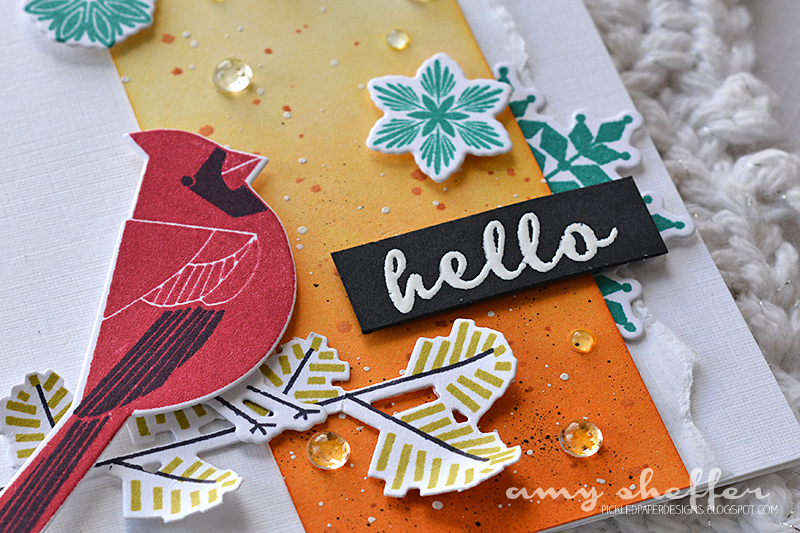 Welcome to Day Five of Papertrey Ink's November release countdown. Up today: birthdays and other celebrations. 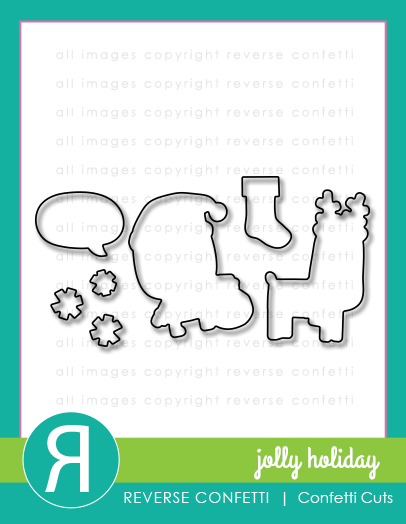 We've got quite a line-up of new birthday-themed stamp sets and dies that you're sure to love! Today's featured products, along with the rest of the November release, will be available at 10 pm EST November 15 in the Papertrey Ink store. My first card features Scene It: Celebration, Birthday Cheer, and Type Strip Numbers III. 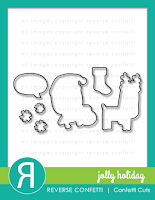 I started by die-cutting a handful of the banner in a circle (using a Scene It: Celebration die) and stacking theme together. 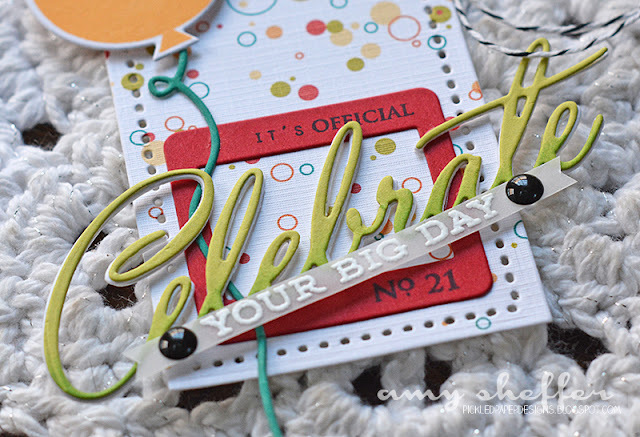 Next I stamped the banner sentiment, from Scene It: Celebration stamp set in Orange Zest. I used the same die-cut and cut a banner circle from red card stock and a pattern from Maile's new Ombre Stripes paper collection, then pieced them in above and below the banner. I added another layer to the circle stack, the one with the stars. It has been stamped in a combination of Limeade Ice and New Leaf. 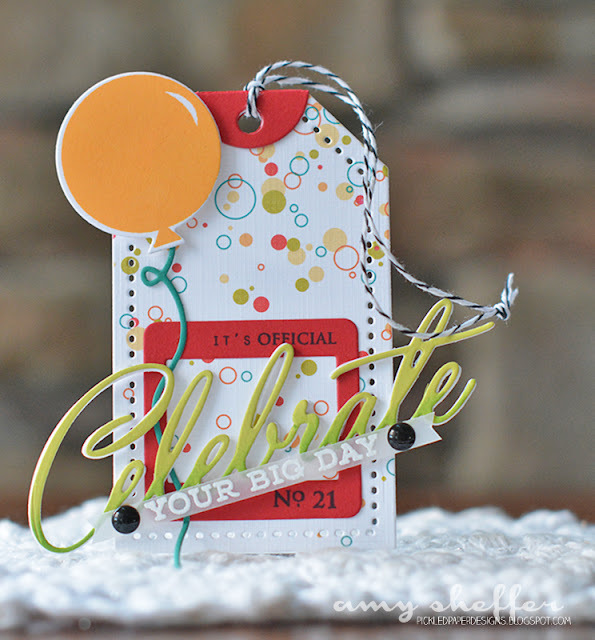 The "celebrate" die-cut is from Birthday Cheer. I've enjoyed Holiday Cheer so much, so I was super excited to see this in the November release. 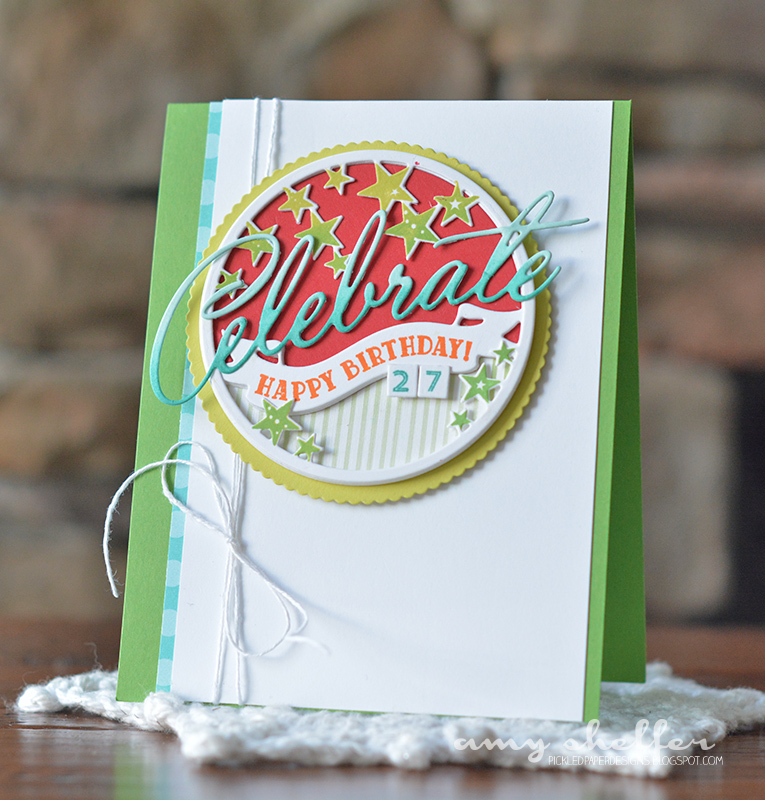 To personalize the card a bit, I added a "27" using the Type Bits Strip die and the Type Strip Numbers III stamp set. Next up is a fun tag to celebrate a 21st birthday. 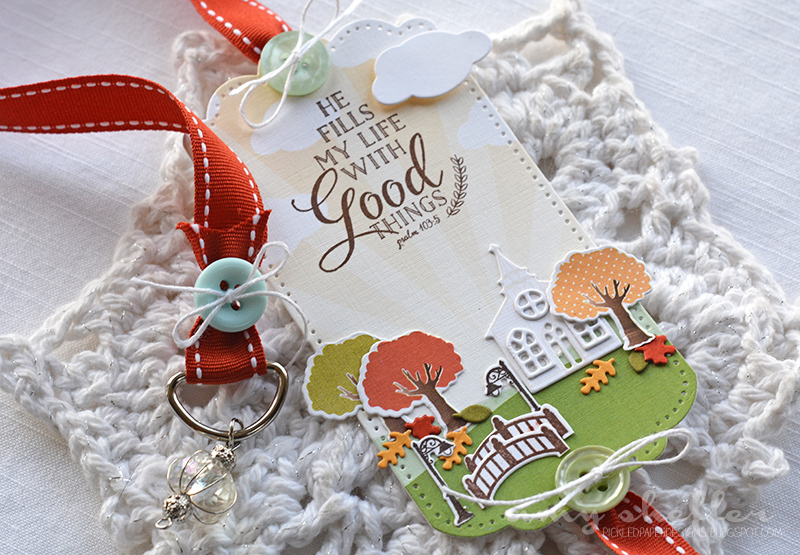 I started by die-cutting a tag base out of Lizzie's Confetti Toss Paper Collection using the Tag Sale #3 die. In the back is a mini slide frame that I die-cut and stamped using Heather's Mini Slide Frame stamps and dies. These are so adorable and such a fun little accent! 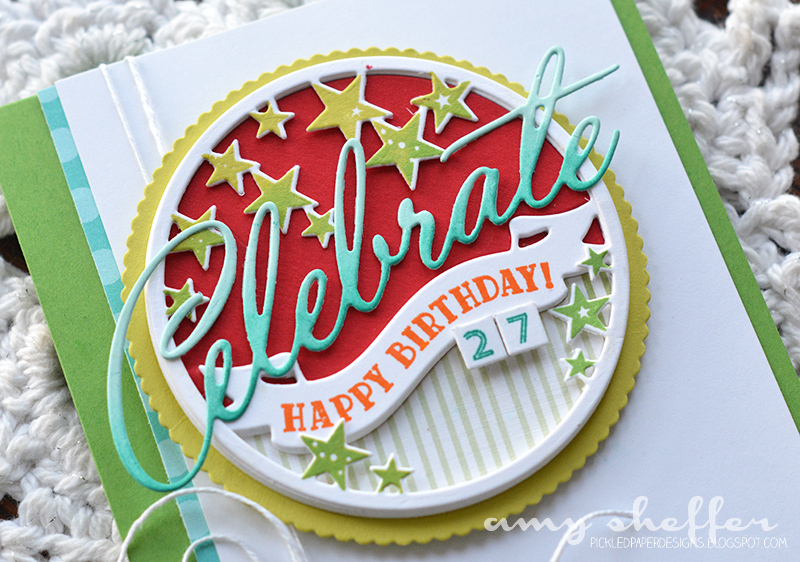 The celebrate die-cut, once again, is from Birthday Cheer. I die-cut it from Limeade Ice and sponged on some New Leaf ink. "Your big day" is stamped in VersaMark on vellum and white embossed. 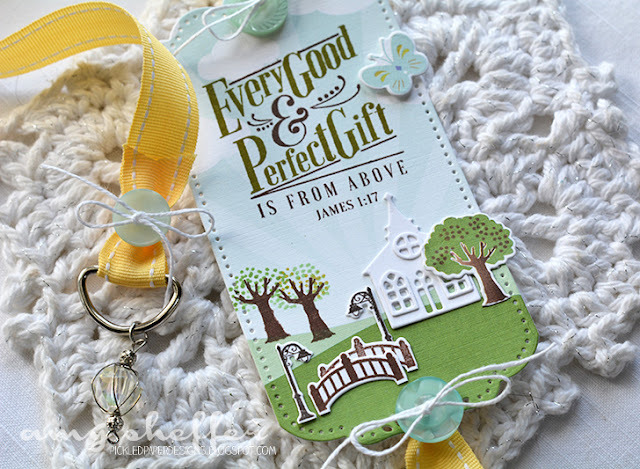 For an embellishment I added a ballon from Birthday Style and a string that I die-cut using the Balloon Strings die set. 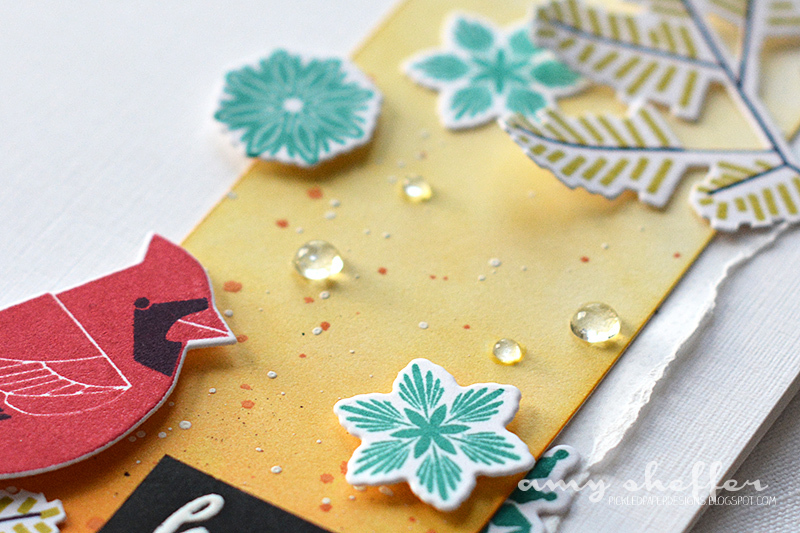 For my last card, I couldn't wait to try some DIY confetti stamping. Lizzie's Confetti Toss set is so fun. 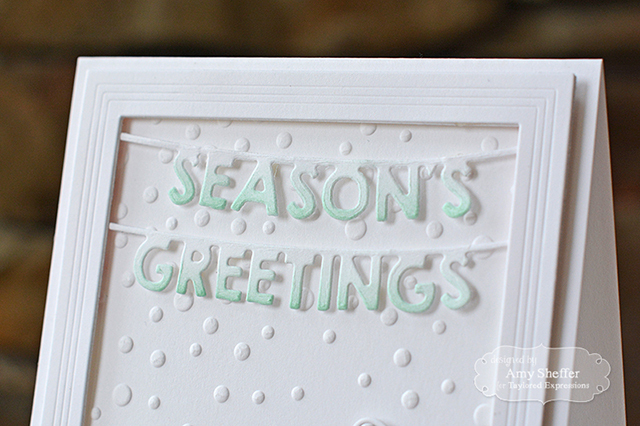 The combination of tight and loose confetti groupings, as well as the little individual dots, makes the stamping part effortless. The balloons are from Birthday Style, plus Balloon Strings. 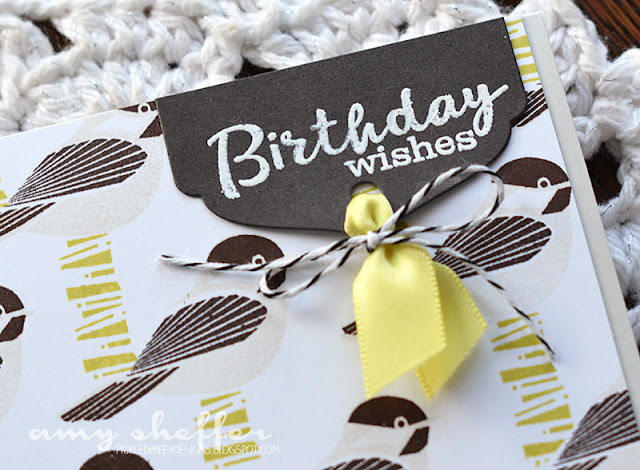 The sentiment was done with the Birthday Cheer stamps and dies. 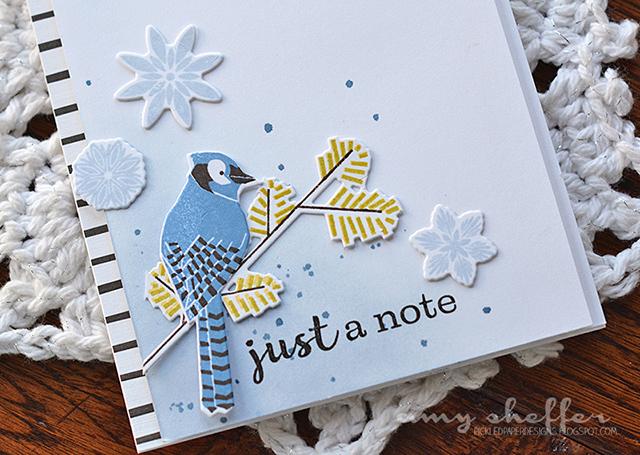 Welcome to Day Three of Papertrey Ink's November release countdown. 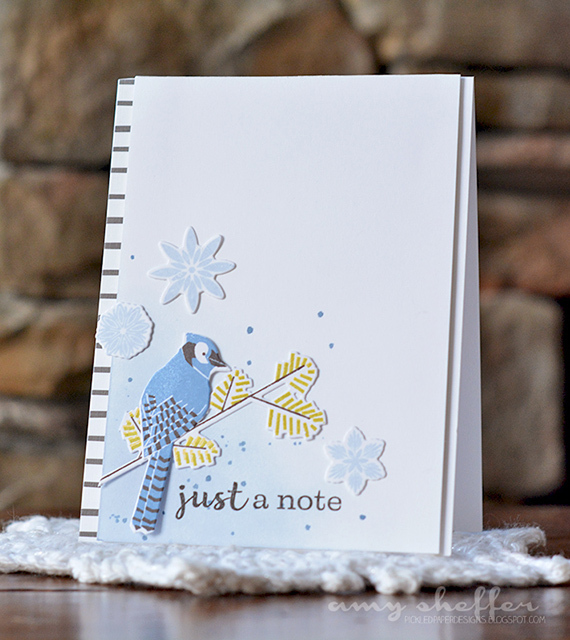 The November release will be available for purchase at 10 pm EST November 15 in the Papertrey Ink store. 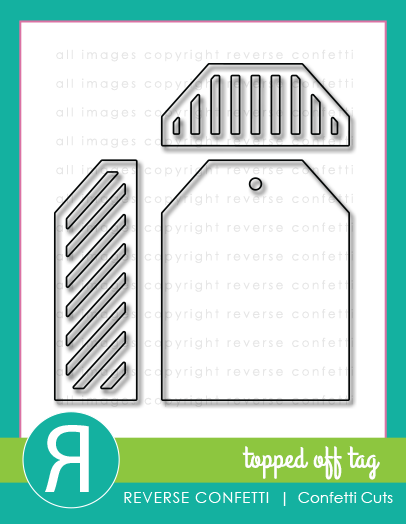 Today, you're in for a treat -- Betsy has designed a scenery stamp set for the Petite Places series: Walk in the Park. Cobblestone paths, a darling bridge, trees and shrubs, even street lamps. 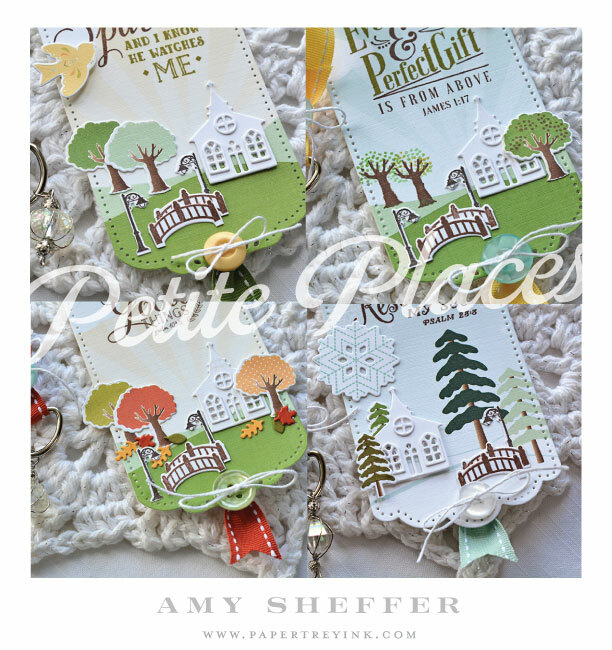 She has also designed a Petite Places paper collection that includes both scenic background designs as well as sheets of pre-printed trees and shrubs ready for die-cutting. Today the team is revisiting the entire Petite Places collection and combining previously released favorites with these new scene-building elements. 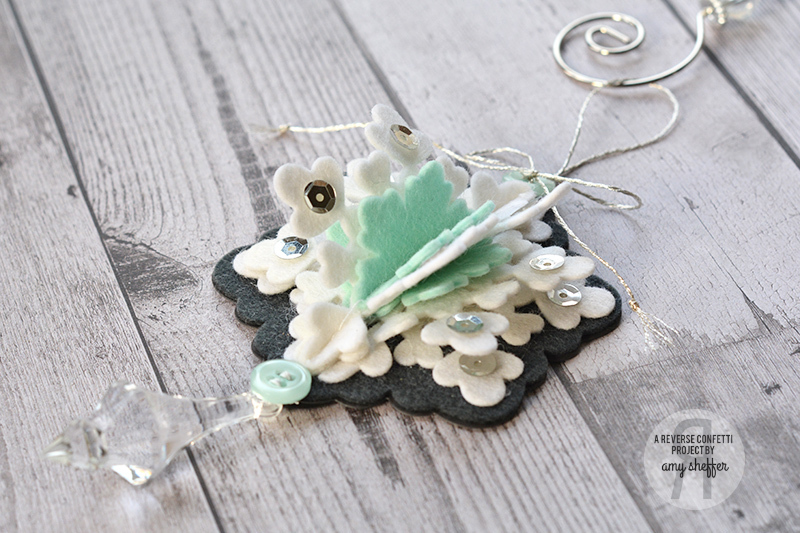 For a fun twist, Nichole has also asked us to create four seasonal variations of our project design. 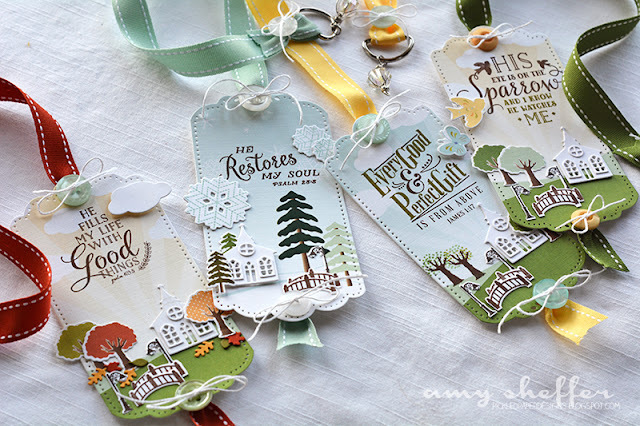 I decided to make a set of bookmarks featuring the Petite Places: Church, Walk in the Park, and Scripture sentiments from Betsy's Phrases & Praises, also releasing this month. 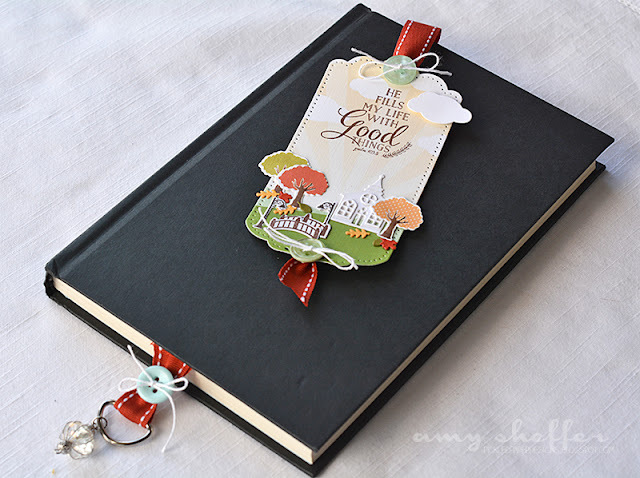 The bookmark style is such that the length of ribbon slips between the pages and the bookmark part sits on the front cover. All four bookmarks begin with the Basic Bookmark 3, which I die-cut from the Petite Places Paper Collection. The bridge and street lamps are die-cut and stamped with images and dies from Petite Places: Walk in the Park. The church is die-cut and stamped with dies and images from Petite Places: Church. And the Scripture sentiment is from Phrases & Praises, also coming November 15. To make this specific to Fall, I used fall-colored trees from the Petite Places Paper Collection, and sprinkled on a few tiny leaf die-cuts, which were done with a die in the Shaker Shapes: Pumpkin die set. The winter bookmark begins with the winter scene paper from the Petite Places Paper Collection. 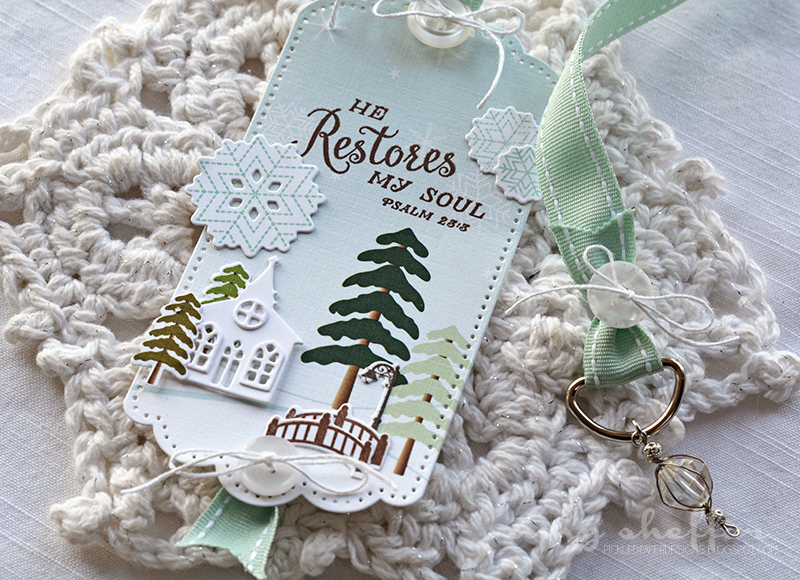 I changed to a winter tree and added snowflake accents (using Quilted: Winter stamps/dies). Spring and Summer are very similar. Both have the same layout and the sun rays background. 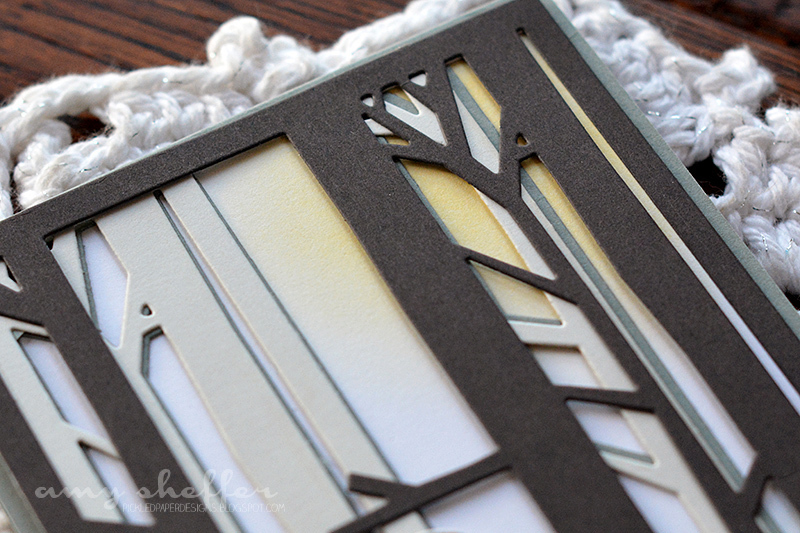 The main difference is the trees: The Spring bookmark shows two trees just beginning to get their leaves and one tree that is flowering. I used one of the shrubbery stamps to create both of those looks. 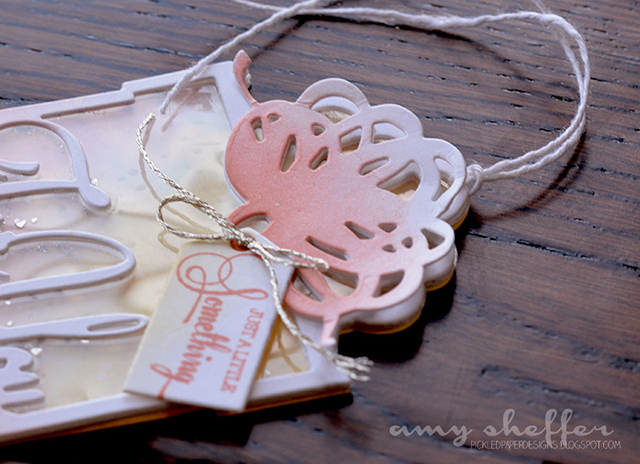 For an embellishment, I added a die-cut butterfly from the Wee Folk Make-It Market Mini Kit. And last, Summer. Here, the trees are in full leaf and the background is the warmer yellow sky. 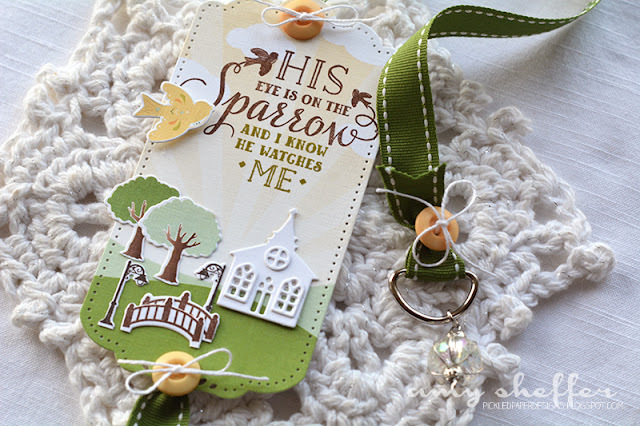 The sparrow embellishment came from the Wee Folk Make-It Market Mini Kit. 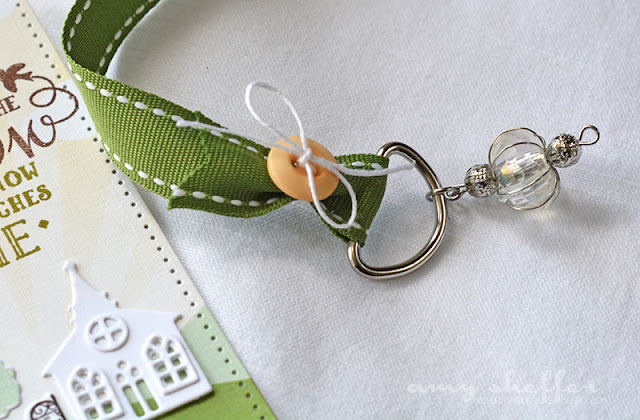 I finished off the ends of the bookmarks with a dangling bead. This is my second post today. For Reverse Confetti's Crazy For Christmas project, scroll down or click HERE. 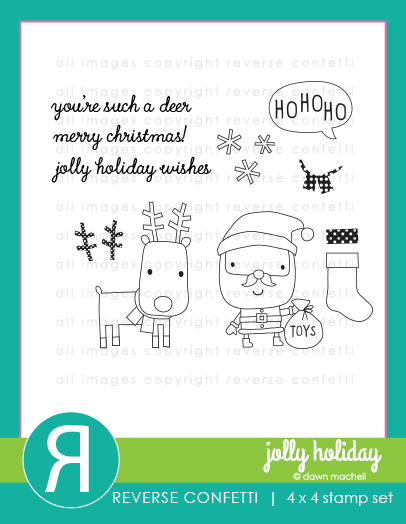 Papertrey Ink's November release countdown has begun. The senior DT kicked things off Tuesday and yesterday, so if you missed those introductions, head to Nichole's blog to catch up. 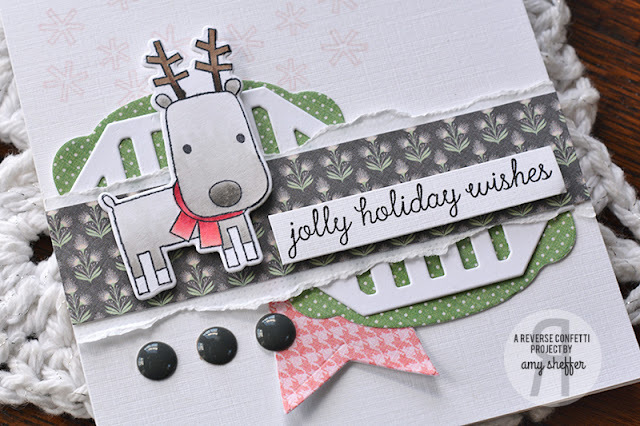 Today, the whole team will be showcasing the Winter Woods stamp set and dies, Winter Woods Cover Plate, and Winter Woods paper collection, designed by Nichole Heady, as well as Fab Flakes stamps and dies, designed by Dawn McVey. Surely one of the most welcome parts of winter is looking out across a snowy white landscape and seeing a cardinal or some other colorful winter bird. Assurance that yes, there is life out there, and yes, there is color, too. Inspired by that notion of brightly colored birds against a snowy landscape, I created a bright and colorful grouping for my card and placed it on a solid white background. The yellow/orange ombre background strip is done with ink blenders, Summer Sunrise ink and Orange Zest ink. I splattered on Canyon Clay ink and white paint, plus a tiny bit of black spritz. That panel is layered onto some torn Linen Vellum, then adhered to the Fresh Snow Linen card base. Everything else is stamped die-cuts. The two-step bird images are so gorgeous and quick to stamp! I used a stamp positioner to help make sure the second layer was aligned correctly. 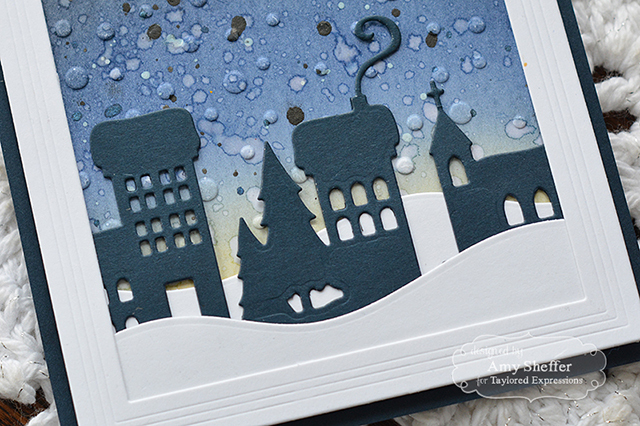 Dawn's Fab Flakes is filled with gorgeous snowflake images. Many of them easily double as flowers, too, for added versatility. I added a few Rainstones here and there. 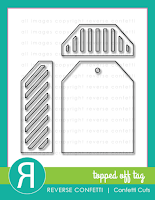 I didn't even know about these until Laura Bassen used them during Stamp-A-Faire in August. Love them! The Winter Woods Cover Plate is quite striking. Stamp birch bark details on them or leave them plain like I have here. 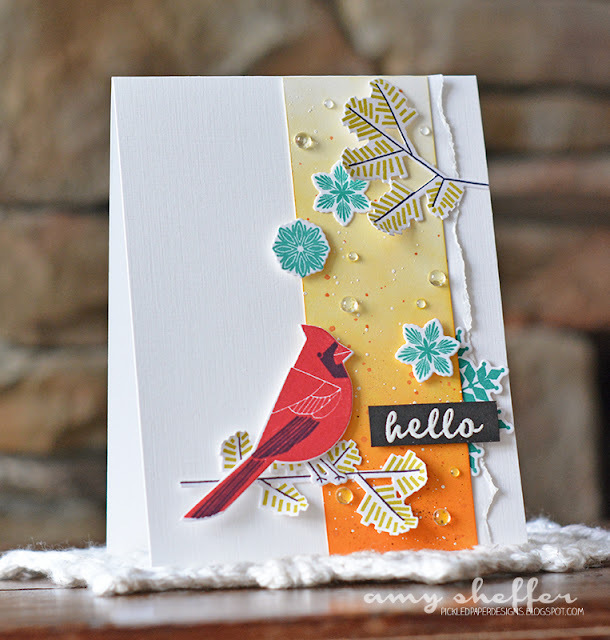 If my first card was all about bright and colorful, this one is serene and neutral. 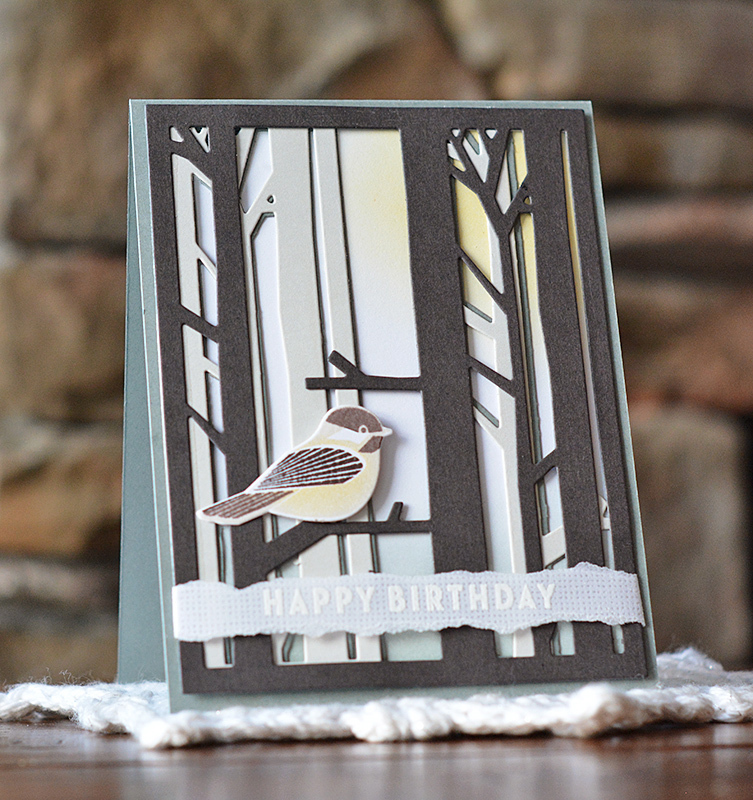 For this layered background look, I used three Winter Woods Cover Plate die-cuts. The Smokey Shadow top layer stayed intact. The Soft Stone and Stormy Sea layers were cut apart and offset. 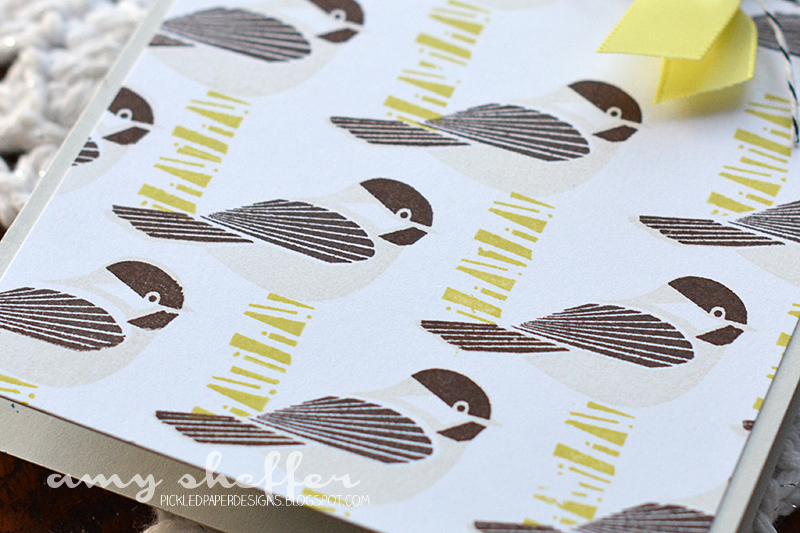 The chickadee is stamped in Soft Stone and Smokey Shadow. To get the golden breast color, I inked up the image in Soft Stone, then sponged Harvest Gold ink onto the stamp before stamping. 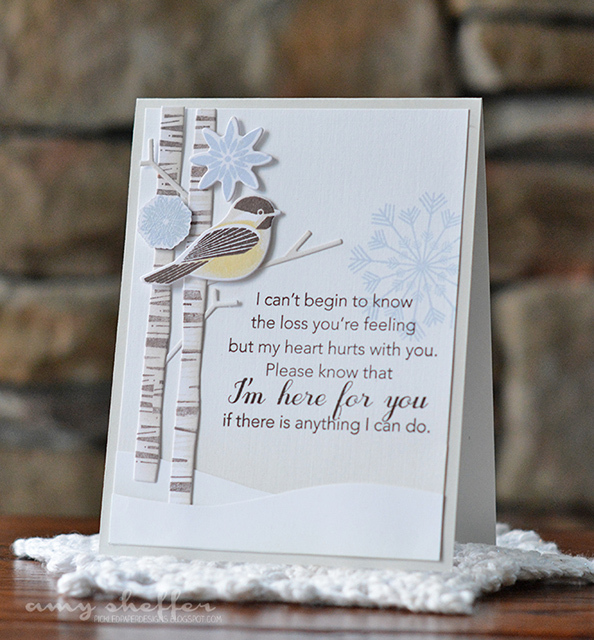 The sentiment, which you'll see more of on Saturday, is heat embossed in white on Linen Vellum. I sponged some Harvest Gold in the upper right corner for the look of moonlight (or sunlight). You can't see it in this photo, but I sponged on some of the new Stormy Sea ink along the bottom, too. I tried something a little different with this last card. 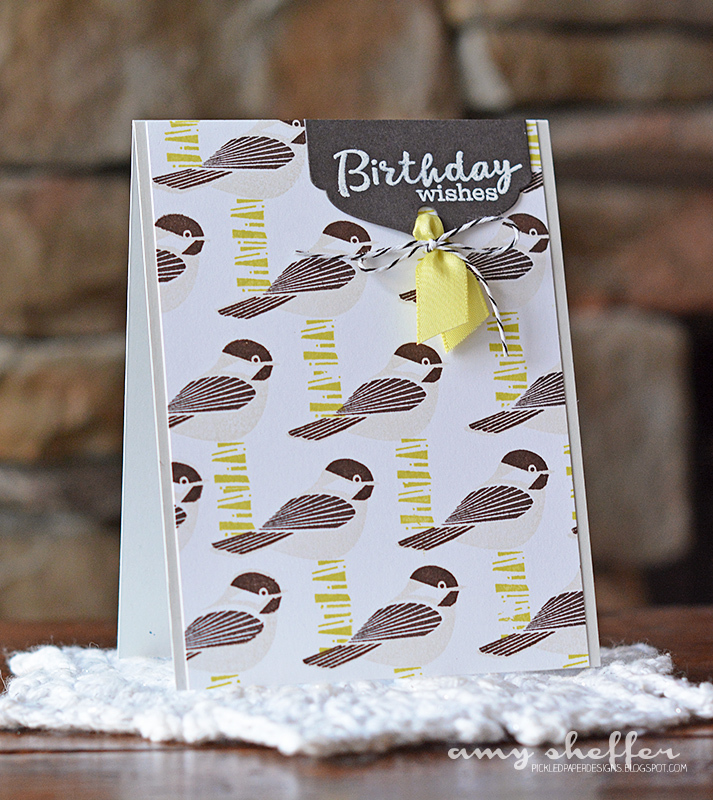 Here, I've used the chickadee image and the birch bark lines to create a fun stamped background pattern. Reminds me of wallpaper or fabric. The Soft Stone body shows up lighter on-screen than it is in real life, so on the actual card, the body does stand out quite a bit more! I used the birch tree detail image (the lines) for an abstract pop of color. To keep the focus on the background pattern, I kept the sentiment small and placed it in a corner. 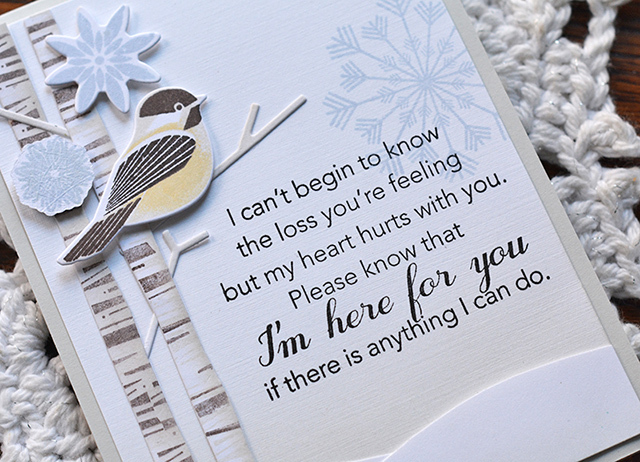 The sentiment is from Winter Woods, and is stamped and heat embossed onto a Smokey Shadow Tag Sale #8 die-cut, which I trimmed down to fit the card.